350-Series Products are permanently flexible breathable masonry coatings and sealants designed to waterproof and decorate vertical and sloped above-grade surfaces, including walls exhibiting small working cracks. They have high vapor permeability, retainh flexibility at low temperatures, and can be applied over a wide variety of previous coatings and treatments. ELASTO WALL 351 is a permanently flexible breathable masonry coating designed to waterproof and decorate vertical and sloped above-grade surfaces, including all types of natural stone, and including walls exhibiting small working cracks. It has higher vapor permeability than some mineral coating products, and can be applied over a wide variety of previous coatings and treatments. Architectural Coatings test kits allow small-scale mock-up installation prior to larger volume purchases. Designate custom color (if known). Select desired coating. ELASTODECK 350 is a permanently flexible, breathable non-traffic deck coating designed to waterproof and decorate horizontal and sloped above-grade surfaces, including concrete, slate, terra cotta, and weathered bituminous systems. It has higher vapor permeability than many roof coating products, resists degradation under temporary water ponding conditions, and can be applied over a wide variety of previous coatings and treatments. 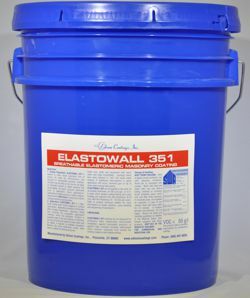 ELASTO MASTIC 352 is a knife-grade, higher solids formulation designed for pretreatment of surface defects and cracks prior to general coating application. Depressions and defects are simply "spackled", and then a 350-Series coating is applied after drying. ELASTO-TONE 353 is a highly permeable finish system for economical color coatings and "touch-up" applications. Based on the same chemistry as ELASTO WALL 351 , it features high elongation and low temperature flexibility, while offering greater economy, due to lower build and higher application rate. ELASTO-FILL 354 is a higher solids, lightweight version of ELASTO-MASTIC 352. It is used where higher builds of filler are desired, with lower shrinkage.